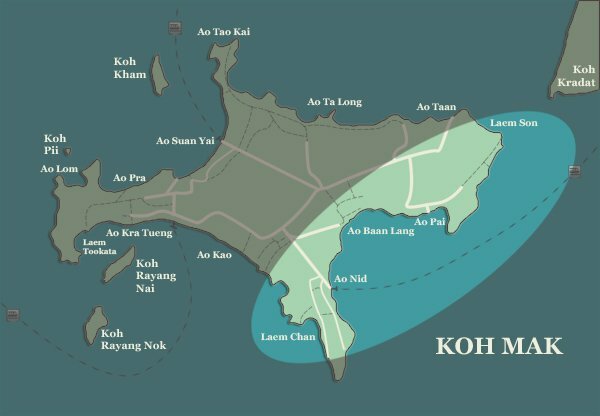 The south and east coasts of Koh Mak run from the headland at Laem Chan up to Ao Nid and then along its rugged coastlines at Ao Baan Lang, Ao Pai, Ao Khanoun and up to Laem Son in the north east corner. Hidden away among pockets of everday local island life, these secluded peaceful spots offer visitors a different perspective on Koh Mak and whether you stay in one of the few resorts or just explore over a day, the south and east coast is certainly worth making time for. Located in the south, Ao Nid is perhaps the least touristy area on this side of Koh Mak and in truth, it’s an unattractive part of the island, with just one central street leading down to the main public pier. Yet as is so often the case, take a look around and you’ll find there’s plenty on offer. From behind the pier at Koh Mak Resort on Ao Suan Yai Beach, the main road goes directly across the island to a crossroads. Turning left here takes you to an original Koh Mak fishing community on the Koh Mak north coast and straight on heads out to the north east and east coast respectively. With a right turn, however, you pass the old electricity generator and the police station before arriving at another small junction, where a left turn takes you onto the Ao Nid road. Continuing straight on here, by the way, leads to the southern end of Ao Kao Beach at Coco Cafe. Along the road in Ao Nid, heading down towards the pier, you pass the cheap and cheerful Peaw and Om restaurants, the clinic, school, the French diner Chic and Chill on your left and on the right, Koh Mak Sports Bar, a couple of other cheap spots for food as well as the track which leads to Lazy Days Resort. The temple can be found at the bottom end, just before the little side road which drops down to Koh Mak Seafood Restaurant and the Koh Mak Museum. At the very end is the pier itself, where the Boonsiri Catamaran, Suansuk Speedboat, Seatales Speedboat and the thrice weekly wooden goods boat all dock. KohMak Steakhouse sits next door to the pier, with Ao Pong Bungalows further along on a nice small beach and Coffee and Sweetcake, a cute coffee shop, located up above, overlooking the bay. Opposite the temple gate and next to the E-Sarn Kitchen, another well marked road snakes off to the right through the coconut plantations. Following this, takes you to the very south of the island at Laem Chan, with smaller tracks leading off it to Koh Mak’s first glamping resort, Naivacha Tent, in Ao Daeng, the bungalows and popular bar restaurant at Banana Sunset and the unique stilted accommodation at Pano Resort, which sits on its own small lagoon. Koh Mak Animal Clinic, always happy to receive volunteers and donations, is also tucked away in this area. 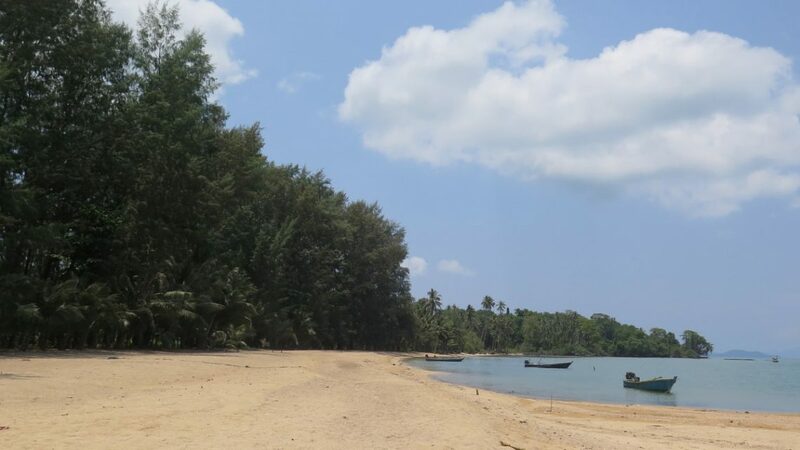 There are no beaches in this part of Koh Mak but the coastline is superb, with one abandoned restaurant high up on the hill at the most southerly point near the bungalows of Talay Time, giving a wonderful panoramic view. For reference, Koh Kood is the island you can see on the horizon. By following the back road, it is possible to make a full circle from nearby Pano Resort, so that you emerge above the pier at Ao Nid behind Coffee and Sweetcake. Heading once more along the Ao Nid road away from the pier back towards the junction, a small turning on the right by the minimart opposite Koh Mak Sports Bar, marks the start of the route up the east coast. After passing a few houses, the road heads into the rubber trees and inland forest, skirting through the pineapple fields. 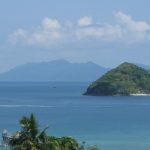 Known locally as Ao Baan Lang, there are four resorts tucked away in this area, all offering great views out to sea. First up is Sea Breeze Resort, with Buri Huts Natural Resort, a few minutes further on, straddling the hillside down to the coarse sand beach beneath. Bamboo Hideaway and Sea View Bungalows, the one next door to the other, are perched above. Beyond Sea View, the road bends to the left and you soon join up with main eastern route, the route in fact that can be taken at the crossroads when coming from behind Koh Mak Resort at Ao Suan Yai. Soon enough, a road to the left leads to Green View Resort and another going straight on, to Cinnamon Art Resort. The third option, signed for Little Moon Villa, follows the bend around to the right and passes through a very picturesque forested avenue before skirting above Plubpla Koh Mak Retreat in Ao Pai bay, with another small fishing community nearby. En route, you pass various dead-end concrete tracks which lead to nothing but the sea, all fun for exploring with some great views down the coast. Just before the access point to Little Moon Villa in its bay at Ao Khanoun, another small road on the left leads into the forest, which in turn becomes a track and ultimately brings you out on the route to Cinnamon Art Resort. Beyond Little Moon Villa, the ever narrowing path, still just about passable despite the coconut fronds lying all around, heads off into the distance and finally emerges on the completely deserted and utterly beautiful beach at Laem Son. There is a half finished pier, a couple of somtam beach restaurants with tables and chairs fashioned out of coconut trees and the odd boat or two, which can ferry you across to Koh Kradat which shimmers on the horizon just across the water – 200bt per person return for the boat and 150bt per person for the island entrance fee. For this fee, you get to potter around on the back of an old tractor to see the star attraction, the island’s herd of deer.